If you want to increase the shine of your hair or if you want to lighten or darken your hair, for this you dont need ‘chemical’ colors, you can also achieve that naturally. Constant changes on your hair color means more treatments that can damage and dry out your hair and of course, more money to spend. If you want to experiment with shades we suggest you to turn to natural methods of hair coloring. If you want shiny hair, just mix one egg white, one tablespoon of olive oil and honey and apply this paste on damp hair and the scalp. Cover your head with a shower cap or towel and let it stand for 20-30 minutes and then wash your hair as you do regularly, just without usage of conditioners, just with some mild shampoo and warm water. 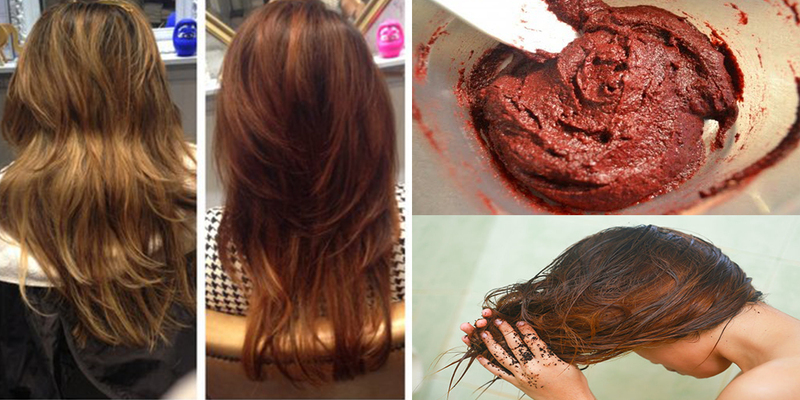 With the help of mixture of honey and cinnamon you can lighten your hair for a few shades. In a plastic bowl, mix two Tbsp hair conditioner, four Tsp of cinnamon powder and three Tbsp of honey. Mix well until you get homogeneous mixture and then apply the mixture on washed and damp hair and comb, but, apply only to the highlights, not at the root of the hair. When you are done, wrap the hair with plastic foil and leave it on for two to three hours, then wash it with shampoo. The longer you hold the mixture and repeat the process, the result will be more visible. If you have brown hair, you can enhance the colour or give her a chocolate shade with a tea of dried herbs. You will need half cup sage, one Tbsp rosemary leaves, one Tsp nettle leaves and three cups of water. Plants should be cooked in water for about 25-30 minutes, over low heat, then strain the tea and let it cool. Use the tea to rinse your hair after shampooing. For natural redhead who want to increase the shade, or if your hair is brown or blonde but you want you to get the copper glow, make tea with two cups of water, half cup of marigold petals and two Tbsp hibiscus. This tea should be cooked over low heat for about half an hour to 45 minutes, then strain it and cool it. After shampooing, rinse your hair with this tea and it is desirable to dry it on the sun. Repeat the process more time, for more visible copper shades. You can darken your hair for five shades if you are persistent enough. All you need to do is to cook a couple of cups of strong black coffee or strong black tea, then cool it and then rinse your hair, which is already washed. When this is done, wrap your hair with foil and leave it for about half an hour, then rinse with plain warm or better, cold water. Repeat the process few times during the week until you get the shade you desire.